If you’ve ever spent time in Paris, are observant and like graffiti, then you won’t have failed to notice Monsieur Chat curled up on the sides of buildings and chimmey stacks across the French capital. 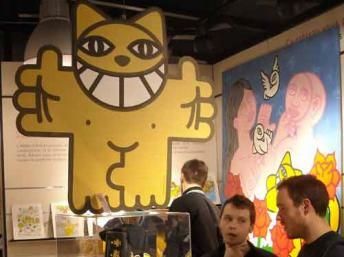 The bright yellow smiling cat appears at a new exhibition in the city’s business district. Thomas Vuille, alias Monsieur Chat, has been painting street art since he was 15 years old, amassing an incredible feline presence across Paris and other cities across the world. At one point Monsieur Chat purred at 80 different locations in Paris alone. Mr Cat told RFI that around 20 per cent have been “deleted”, some propriétaires obviously not too happy about Vuille climbing across their rooftops to ink another acrylic cat. His new book M Chat provides a chronicle of his journey, illustrating Monsieur Chat’s pawprints around the planet. Katre and Yosh, two French graffiti artists, joined Monsieur Chat at Les Griffes de la rue exhibition for wine at the uber cool Arteum exhibition opening. Yosh put up a piece on the shop window. While the nonchatlant Monsieur Chat managed to smash one of his own paintings during his discussions with journalists. This typifies the laid-back, unassuming Vuille. For him, giving Monsieur Chat a home around the streets of Paris is as important as selling a painting for a couple of hundred euros. He laughs out loud after accidently smashing the painting frame in the exhibition space. “The first little girl who drew the first cats…that inspired me,” he says, recounting a sweet tale that will be outlined in the forthcoming book. The cat represents happiness and “all the people I’ve met who’ve influenced me”. Australia is the only place the cat hasn’t visited yet. And when asked about a companion for Monsieur Chat, Vuille reveals that he is working on Mr Duck, plus more merchandising for his bright cartoony animal characters. Stéphane Duc, the co-founder of Arteum, says the exhibition is “quite different” for a shopping centre and they hope it will give their customers some “excitement”. “It’s art – you don’t have to like it – the idea is to make you have an opinion about it […] not be indifferent, so graffiti is the same,” says Duc. The three artists were chosen for Arteum’s exhibition via an artistic committee and selection process in association with Studio 55, the urban art gallery in the 8th district of Paris.